Mindfulness is everywhere lately. Everybody is talking about it, and the practice of mindfulness is being applied across all aspects of life. It is being used in business. It is being taught in universities. It is being used to improve the performance of elite athletes. It really is everywhere. 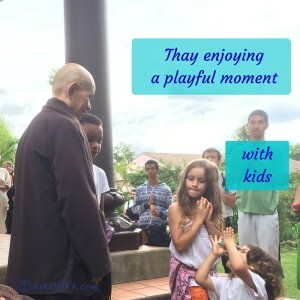 Today, I would like to share what my family and my kids learned about mindfulness from Zen Master Thich Nhat Hanh during a summer retreat, and how this useful life practice can be explained and shared with your kids! So first, what IS mindfulness? Mindfulness is an ancient eastern practice of awareness which is now backed up by scientific research from around the world. Simply stated, it is the practice of living and being fully present in the now, fully present in the moment. While this is a very simple concept, it can be challenging to understand, communicate, and implement in daily life. However, it is particularly useful for the kind of life we live today! Mindfulness is a fantastic antidote to the multitasking, distracted and stressed society we have created for ourselves. When I got interested in mindfulness a few years ago, I was fascinated by it and decided to dive deep. My research brought me to the work of one of the leading voices in the mindfulness movement, Zen Master Thich Nhat Hanh. Thich Nhat Hanh is a monk who was exiled from his homeland in Vietnam for his peace activism during the Vietnam War. Among many other distinctions, he was nominated for the Nobel Peace Prize by Martin Luther King, Jr. in the ’60s. He currently lives near Bordeaux in southern France at Plum Village, the largest of several Zen monasteries he has founded around the world. Many credit Thich Nhat Hanh, or Thay as he is affectionately called, with bringing this eastern practice of mindfulness to the west by translating it and making it more accessible for western cultures. Then I discovered that he leads family retreats at Plum Village every year during the month of July. I decided that my family just had to go learn more about this straight from the source! So, after a bit of selling this idea to my family, reservations were made and off we went for a week of mindfulness meditation in the South of France. We had an absolutely amazing week! It was fantastic, and we learned so much, too much to share in a single post like this. However, I would like to share two beautiful ways in which you can explain the idea of mindfulness with your kids, and how it can be used to bring them self-acceptance, self-confidence, calm, and freedom! Essentially, the Mind in a Jar is a visual representation of our mind using a jar of water and sand or glitter. The grains of sand or glitter represent our thoughts and our emotions. If we shake the jar so the sand is suspended in the water, this is what our mind looks like when we are not being mindful. It is cloudy and foggy. Our brain is hostage to our emotions or lost in thought, and we cannot think clearly. In this state, we can easily be confused, become more prone to irrational actions, and not make good decisions. However, if we take a moment and allow the sand in the jar to settle, we will see that the water becomes clear. And even though the thoughts and emotions are still there at the bottom of the jar, they are settled, and we can make more rational, thoughtful and wise decisions. When we are mindful, we are calm, present, and able to think (and learn!) with more clarity. This is a beautiful way to teach the abstract concept of mindfulness to our kids. I believe it can really help them during times of anxiety, stress, anger, fear, and other challenging emotions both now and in their future adult lives. 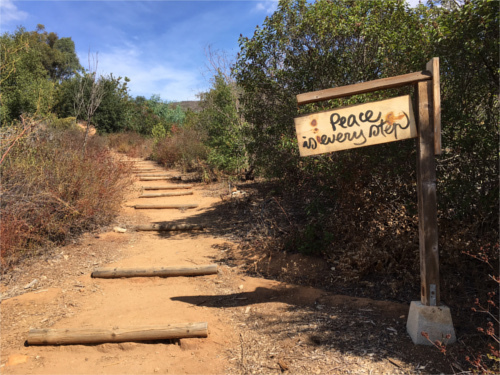 The second way my kids learned about the concept and practice of mindfulness at Plum Village was through the beautiful exercise of Pebble Meditation. This simple practice can help teach our kids self-acceptance, self-confidence, calm, and freedom when they are often surrounded by a world of teasing, bullying, fighting and control. Breathing in, I see myself as a flower. Breathing out, I am beautiful just as I am. I feel fresh. Breathing in, I see myself as a mountain. Breathing out, I feel solid. Nothing can move or distract me. Breathing in, I see myself as still water, a calm clear light. Breathing out, I reflect things just as they are, inside and around me. Breathing in, I see myself as the blue sky with a lot of space in and around me. Breathing out, I feel free and at ease. These are all such beautiful ideas to share with our children! The flower pebble teaches our kids that they are beautiful, just as they are. It communicates self-acceptance. The mountain pebble teaches our kids they are solid. They can have their own ideas, and convictions, and communicates self-confidence. The water pebble teaches our kids to be calm. It teaches them to see and communicate with honesty and clarity. The sky pebble teaches our kids they are free. Free from worries. Free from their emotions. And free to be at ease with themselves. I believe it is important that our kids are equipped with tools to handle the challenges they face when they are out in the world without us. Simple techniques like this Pebble Meditation can help them be strong in the face of adversity when they are on their own now as growing children and also in their future adult lives. 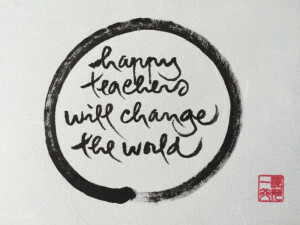 Finally, I would like to close by sharing a quote from one of Thich Nhat Hanh’s calligraphies, “happy teachers will change the world”. Whenever I see the word teachers, I always think parents as well since we are the original and lifelong teachers for our children. I agree with Thay that we, as parents, teachers, and Life Guides can really change the world one kid at a time, and that one way we can be more successful with this is to practice and teach mindfulness in our families. The practice of mindfulness has been a wonderful addition to our family life, and I hope these ideas we received at Plum Village can enrich your family as well! Let me know what you think in the comments below and please share with your friends! Update: My gift to you! You can download the Pebble Meditation cards here! Thank you very much for sharing this lesson!! Teaching mindfulness can be exceptionally challenging to a guide who feels cloudy herself. I am very interested in exploring the pebble meditation, and am wondering how frequent and for what length of time to start my family out on this idea? Hi Andrelle! Thanks for your comment! These are great questions. Mindfulness is a simple concept that is sometimes difficult to implement! My mind is often cloudy as well and that is perfectly normal. What I really like about mindfulness is that it gives us the tools to deal with the floating glitter in our jar! Once we notice that our mind is foggy, we can just pause and take a moment to focus on our breathing (breathing in I am ok, breathing out I am calm). As for the pebble meditation, I have found the best way to share it with children is with a song. After you have introduced the idea and the meditation verbally, you can teach them this song. https://vimeo.com/115647621 (I decided to spare you all of my singing in the video!) 🙂 It is very easy and calming and includes hand motions which kids love. Once they know the song, you can use it anytime you would like to enjoy a calming moment or anytime the kids (or you!) get overwhelmed by strong emotions. For my family, this isn’t something we do on a schedule, but the song has become one of the signals we use to indicate it’s time for everyone to calm down and get centered on the present moment. When repeated over time, the words will reinforce the ideas contained within the meditation for them. I love this, thank you for posting. Nice coincidence, I just posted my really easy instructions for mind jars on my web site yesterday. Great recipe! I love your jars. Beautiful serendipity!